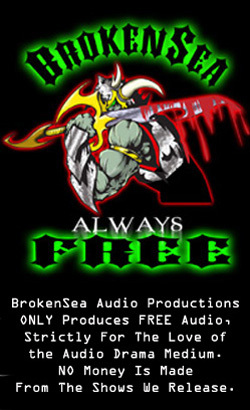 BrokenSea Audio Productions presents: “2109: Black Sun Rising – BSR”. An original Science Fiction Audio Drama…. Mixed, Written and Produced by Bill Hollweg. In the year 2091 the ASIMOV-1 Deep Space Probe was launched. The crew sets out to repair the Asimov-3 having been forced to make a hard landing due to an extraterrestrial gravitational beam originating from the Rogue Asteroid; located halfway between the Earth and Alpha Centauri. While back on the Earth, Solar CIA Director Carlson’s “intelligence gathering and black operations and dangerous liaisons” have come to the notice of more than a few people with reasons, and now proof, to take him down…. And tune in again soon for episode 3! The cast for tonight’s episode. This entry was posted in 1. All Episodes, 3. Series 1. Bookmark the permalink. 24 minutes mixed on ep 3- may have another 5 mixed by morning. More 2109 coming, bear with me- and thank you all for listening! !